Fight against pathogenic and multi-resistant bacteria is a major challenge for human and animal health. The gastrointestinal tract is a reservoir for opportunistic pathogens or pathobionts, which benefit from the imbalance or dysbiosis of the microbiota to invade and infect susceptible hosts. 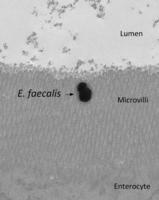 Enterococcus faecalis and Enterococcus faecium, pathogenic in humans, or Enterococcus cecorum in broilers, cross the intestinal mucosa before reaching the bloodstream and spreading through the host. E. faecalis ranks among the top five causes of opportunistic infections in humans. Although harmless and present at a sub-dominant level in the gastrointestinal microbiota of healthy humans, and thanks to its intrinsic resistance to different classes of antibiotics and its ability to acquire new ones, E. faecalis proliferates in the intestinal tract of immunocompromised patients treated with antibiotics, and causes nosocomial infections. Enterococcus cecorum is a commensal of avian species that has emerged as a major cause of lameness in poultry, causing significant economic lost and frequent antibiotic treatments. 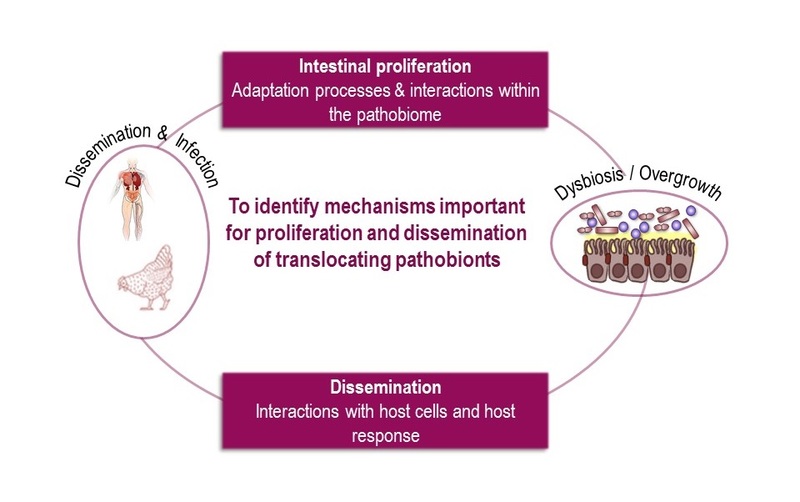 CPE goal is to understand the molecular and cellular mechanisms that allow some intestinal pathobionts to proliferate at the intestinal level and to spread in the host, using E. faecalis as main model organism. - E. faecalis adaptation and proliferation in response to intestinal dysbiosis. Using RNAseq and genetics approaches combined with a colonization mouse model, we study how E. faecalis adapts to bile salts and how the diversity of the parietal rhamnopolysaccharide Epa affects proliferation. - Improvement of intestinal colonization resistance against vancomycin resistant strains (VRE). We aim to identify commensal strains reinforcing the barrier effect of the microbiota in collaboration with mathematicians, who use mathematical modelling to infer possible interactions within the pathobiome. - E. faecalis-host cells interactions and the subsequent host response. We set up an E. faecalis translocation model in mice to assess the mechanisms occurring during intestinal barrier crossing. - Genomic and phenotypic characterization of a collection of E. cecorum clinical isolates. We study the genomic and phenotypic diversity of E. cecorum clinical strains to identify bacterial determinants and isolates applicable for the development of diagnostic methods, and prophylactic and curative measures. Ultimately, our work aims to generate knowledge and to develop diagnostic methods and new strategies to control multi-resistant pathogens.